We’re back! On Friday 27th May, our friends Shitwife will be returning to play for us at Poco Loco, Chatham. Those of you who were at our Homespun Festival stage last year will remember the frenzied beats and frantic distortion from this London based 2 piece. Noise-Pop/Thunder-Punk all the way from Manchester. These guys also played our Homespun stage and impressed with their gorgeous multi-vocal melodies and discordant riffs. Lawn Flamingo – new project from Medway dude Ben Sammon – details to be revealed later! Frau Pouch – sci fi loving lo fi post punk. For fans of the B52s, Wire, A Frames and Cows. Starts at 8.30pm. 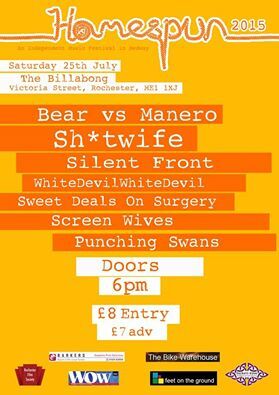 If you turn up at 11, you’ll have missed most of the bands, so do bear that in mind! We run a tight ship here!